This is a magnificent book, written in 1953 by someone who learnt her cooking in English country kitchens in the days before widespread electricity and gas. It’s a combination of food history, recipes, general household advice, bits of personal memoir, opinion, and amusing or interesting quotes from old books. 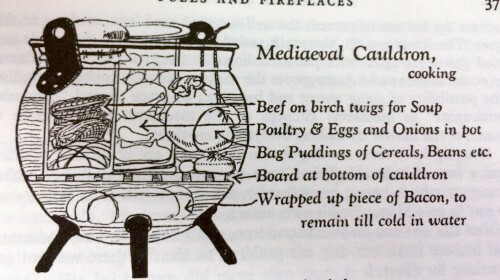 Apart from the obvious stuff — what sauces to serve with mutton*, regional ways to cook a ham, the difference between Welsh, Scottish and West Riding Oatcakes — there are chapters about beekeeping, brewing, butter churns, as well as the chapters about the history of English food: what they ate at medieval feasts, how they stored food for long sea voyages. It really does conjure up a whole lost world: not just because of the foods which have fallen out of favour, like mutton or parsnip wine, but because the recipes pre-date a whole raft of exotic ingredients like aubergine and yoghurt. It was during the acute rationing period that all these ‘teas’ were used in England to adulterate the imported teas. A serviceable English ‘tea’ may be made with blackthorn for bulk, and sage, lemon balm, woodruff (the plant), and black-currant leaves for flavour. Do not omit at least three out of the four flavouring herbs, but let some flavour predominate. Thus, if currant and sage predominate, the tea will somewhat favour Ceylon; if the lemon balm predominates, it will be a more China cup; if the ‘woodruff’, it will have the smoky aroma of Darjeeling. This is Worcestershire and Oxfordshire, and probably very old. Line a shallow dish with thin short crust, butter the bottom, and cover it with thinly sliced apples, and set it to bake until the apples are just cooked. Make a custard mixture of eggs beaten in milk, season strongly with pepper, salt and thyme, a very little chopped sage, and a lot of marigold petals (the common yellow marigold). Pour this savoury custard over the cooked apples and return it to the oven to bake until set. I was told it was served with roast pork, like Yorkshire pudding is served with roast beef (the sage and apple indicate this), but the marigold is more usually a cheese condiment. Sheep’s trotters are the ceremonial part of the Bolton Wanderers football team dinners. Only the heavy types of mountain sheep, such as the Pennine Range sheep, can make this dish well. (I don’t think a sparrow could make a meal off a Welsh trotter, but in the larger breeds of sheep, the trotters are almost as meaty as a pig’s). It’s a genuinely fascinating book both as history and gastronomy.